How did I hear about crossfit? The first time I’d seen or heard anything about crossfit was watching the crossfit games on espn. I had a friend and former college teammate from Iowa that finished 4th at the Asia 2012 regionals. We were extremely competitive in the weight room and I knew I could hang in or even beat him in crossfit. He had mentioned there was a crossfit near Grimes that was one of the top gyms in the midwest. A week later I signed up and hit the ground running. How has CF changed my life? Since my baseball career ended I have been searching different avenues to feed my competitiveness. There is nothing like completing something I previously thought to myself I couldn’t. 515 has changed not only how I view my training but how I train my clients. 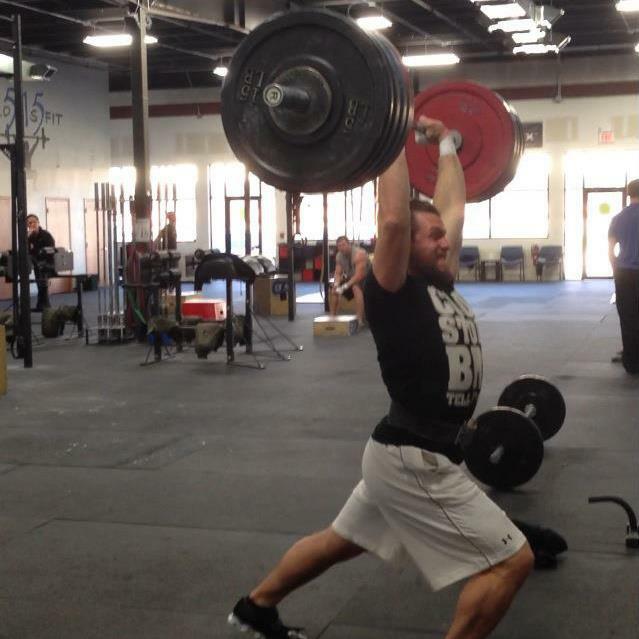 Everyone has a little different experience with crossfit. 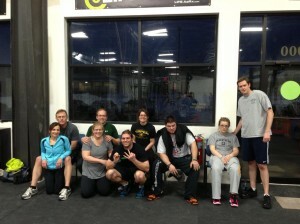 I’m not so sure that I would’ve been as engulfed in crossfit if I hadn’t joined 515. I find myself going in on off days just to hang out with my friends and watch my fellow 515ers shred. 515 isn’t just the gym I workout at it is my extended family. Fav/ least fav movement? My favorite movements are pullups and any variety of clean. Job info: I have been a personal trainer at Aspen for the past 5 years. Family info: I am married to my lovely wife Laura. My parents are Robert and Donna Yoho. I am an only child an like to believe I was so legit my parents didn’t need to have another. Something funny/ interesting: 1. I have the most homeruns in season/career at the University of Iowa dating back to 2002. 2. Also I’ve never seen the following movies in their entirety: Goonies, ET, any Star Wars, Lord of the Rings, Caddy Shack, all national lampoons movies, there are more but those are usually the ones that draw WTF look on most faces. 3. I also am always changing my look. Favorite saying: In the land of the blind the one eyed man is king. Most/ least favorite song: Sober by Tool makes me feel like I could run through a brick wall. Congrats Nate Dogg, you earned it, congrats on a great Open as well. Nate – Congratulations! It’s always great seeing you walk into the gym, a gentleman and a scholar. WTF YOU’VE NEVER SEEN ET? seriously, you’ve never watched the whole thing?